Spring has arrived! It has been a rough winter, and even though the tree pollen is making me miserable… I am so happy that we are even a little closer to my most favorite months: April and May! 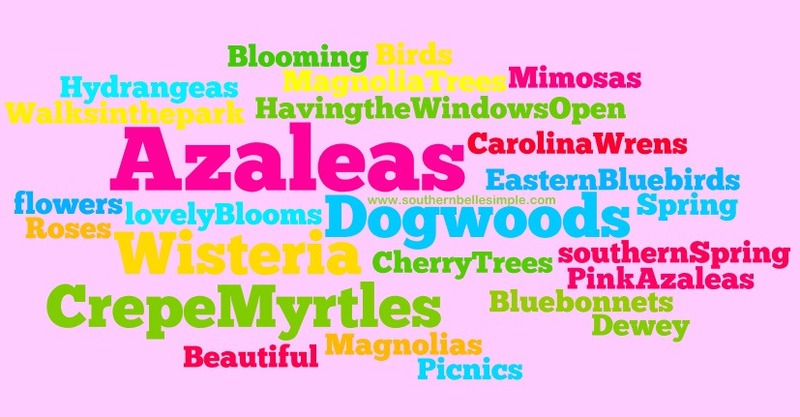 The first azaleas started blooming in the garden this week! The wisteria is about to bloom and the jasmine is starting to pop. Now we just need the pine and elm to move on and I’ll be able to breathe. The best week EVER will happen in early April… MASTERS WEEK! I’ve mentioned a few times how much I love the Masters, I keep hoping that one day I’m going to win the raffle to get into the ticket buying process. Until then I’m going to have to keep relaying on others not being able to go and selling their tickets. Later in the month is my birthday, the Heritage tournament, and then we move on to so many end of the school years events. Once pollen season ends I can’t wait to get out in the yard and plant some flowers as well as getting out on the dam to walk again. Pretty soon I’ll be able to roll the windows down in the car and blast some music for a nice long afternoon drive. May means dinners out on the deck, the blooming of Confederate jasmine and Magnolias and the start of pool season. Oh! And sundresses, sandals and hats! I can’t wait to bust out some of my cute new dresses that I bought at the end of last season. One more winter blast next week and then full-blown SPRING IN THE SOUTH! YAY! What are you excited for this spring?